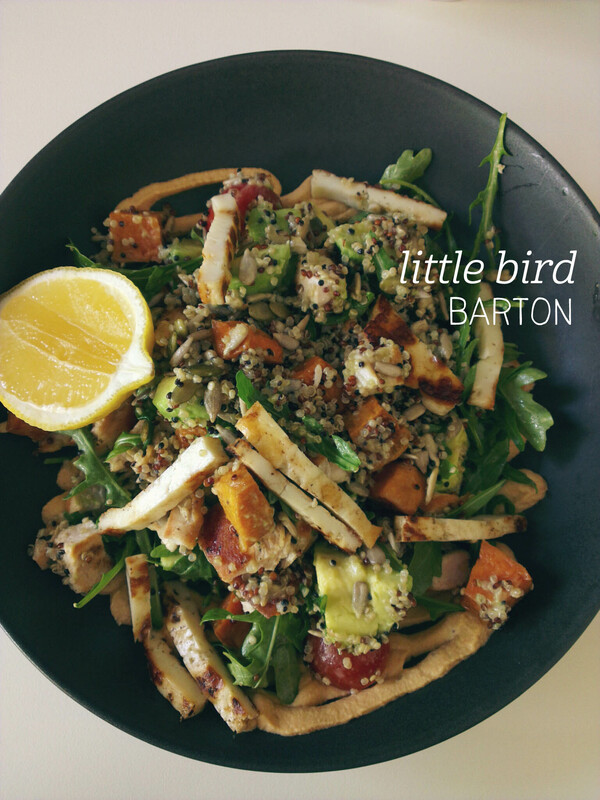 Little Bird is one of the nicest mid-range places in Barton for lunch, and, stopping in with a friend on a warm weekday, I was tempted by their salad options. The quinoa and haloumi salad ($17.5) , while not something I would usually order, turned out to be an excellent choice and one I will happily order again. Firstly, the serving is generous, not just in terms of size, but also in terms of grilled chicken, avocado and haloumi content. These folks know how to cook their haloumi, bringing out the natural saltiness with perfectly charred pieces. This is complemented by the creamy avocado and good dose of chipotle hummus, which adds a nice but not-over-the-top kick to the dish, and also removes any risk of the dish being dry. Roasted sweet potato, fresh cherry tomatoes and rocket make up the rest of the salad, creating a good mix of textures and flavours. The quinoa is a great lunch option, not leaving you feeling sluggish in the afternoon and with a drizzle of lemon on top you couldn’t really ask for anything more. 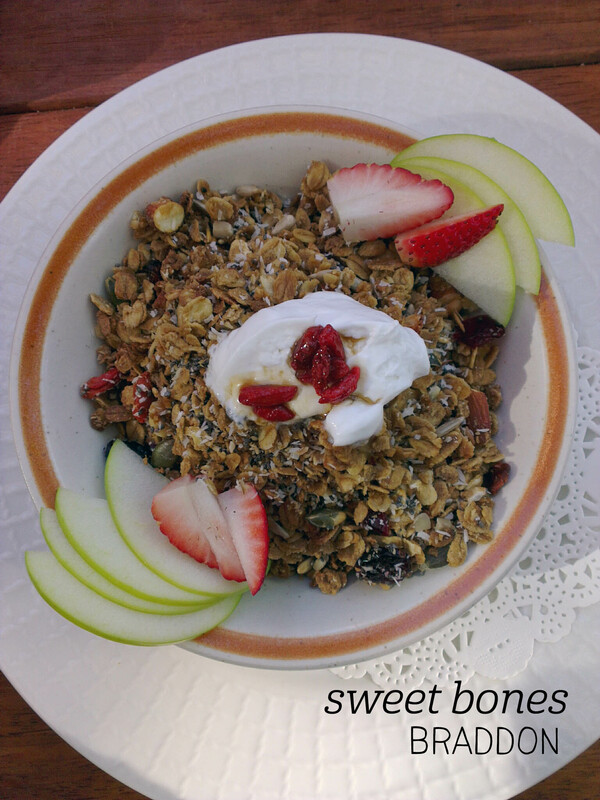 I waxed lyrical about the smoothie bowl at Sweet Bones last time, so when I went back for a book club gathering, I decided to go the whole hog (so to speak) and order the Eileen’s Granola proper (i.e. minus the smoothie – $15). We sat outside for brunch, and to keep warm I started with a soy hot chocolate ($4.50). This was tasty, but certainly not to the standard of places I’ve tried in Sydney or Melbourne, where you can’t tell the difference between soy and regular milk. The granola arrived with a glass bottle of soy milk separately and was topped with a pretty pile of coconut whip and maple-soaked goji berries. The dusting of dessicated coconut and the fresh apple and strawberries on the side made everything look that much more appealing, and digging in, I’m very happy to report that it’s just as good as it was with the smoothie. The list of delicious things in this granola is astoundingly long: dried apricots, cherries, craisins, sultanas, macadamias, almonds, hazelnuts, chia seeds and sunflower seeds. Phew. The real highlight were the macadamias and almonds, which were in generous supply. 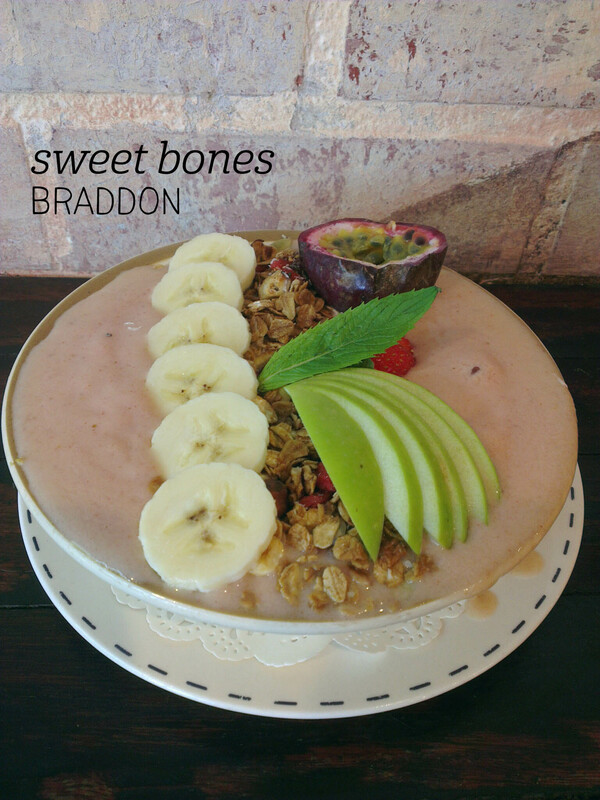 Sweet Bones, keep doing what you’re doing. I must admit, we did come to eat here after seeing how silly the line was at Hardware Societe, but this was one of the best ‘happy accident’ discoveries we had in Melbourne! 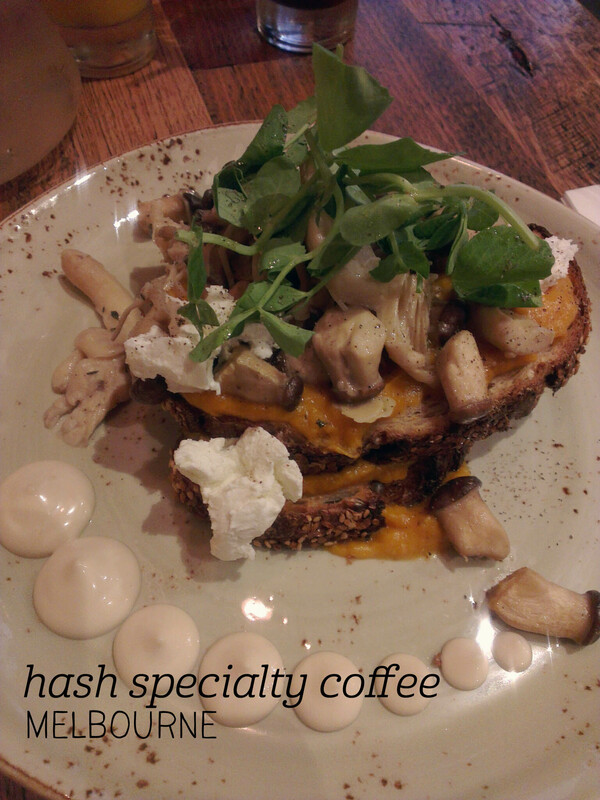 Hash has friendly, welcoming staff who went out of their way to make us comfortable. Craving something lighter, I ordered the Sauteed Mushrooms ($17.5), served on toasted multigrain with pumpkin puree, chevre and smoked aioli. You guys, this would definitely be my breakfast pick of the year! The mushrooms were so cute and plump, keeping all their juiciness with the added thyme from the saute pan. The bread was delicious and absolutely slathered in pumpkin puree, which is now my new ultimate comfort food. But the real winner for me was that smoked aioli. Seriously, get onto it, it’s good stuff. 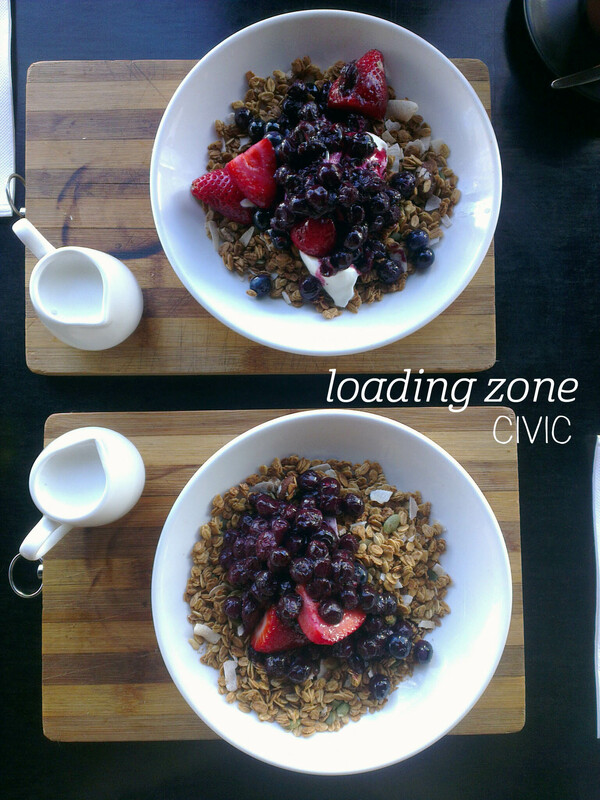 A mouthful with all of the elements, including the lovely strong chevre, was breakfast heaven. They also avoided my pet peeve (inadequate toast-cutting knife) and had appropriate cutlery so I didn’t leave having undertaken an arm workout to eat my food. Unusually, their menu also lists the local provenance of their ingredients – this could definitely be a new trend to keep an eye on. 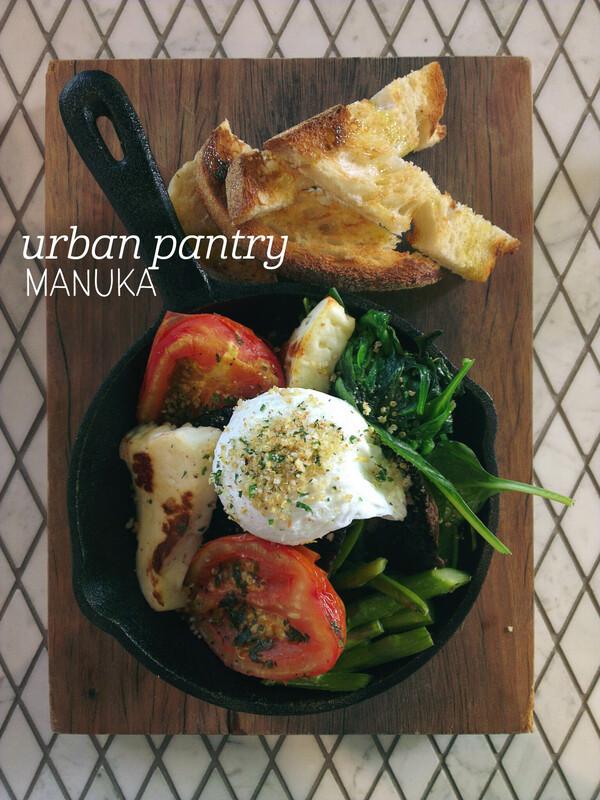 Urban Pantry has undergone a refresh – both to its decor and its menu. The fresh, clean-looking space has made presentation a priority (as its Instagram account attests), so I met a friend visting from Melbourne there to try the new offerings. I ordered the Chef’s Pan ($18), with a poached egg, haloumi, spinach, roast tomatoes, asparagus and mushroom, which sounded like a delicious and healthy way to start the day. Our food came out quickly, and I was smitten with my dish before I took one mouthful, it was so pretty! I broke open the egg, which was dotted with quinoa, and the perfectly runny yolk oozed out to coat the assorted vegetables – mmm. I started with the good stuff – hello haloumi! It was lightly grilled, and had a nice, strong flavour without being overly salty. Winner. Next the tomatoes, which had also been perfectly seasoned and tasted like summer. Tick. I am a huge fan of asparagus and I adored this amount, steamed just right for me (not totally soft) and cut into bite-sized pieces. The mushrooms had a really deep, earthy flavour and it was great to lighten things up with some spinach. The fancy toast served on the side was fabulous too. So, delicious all round really! 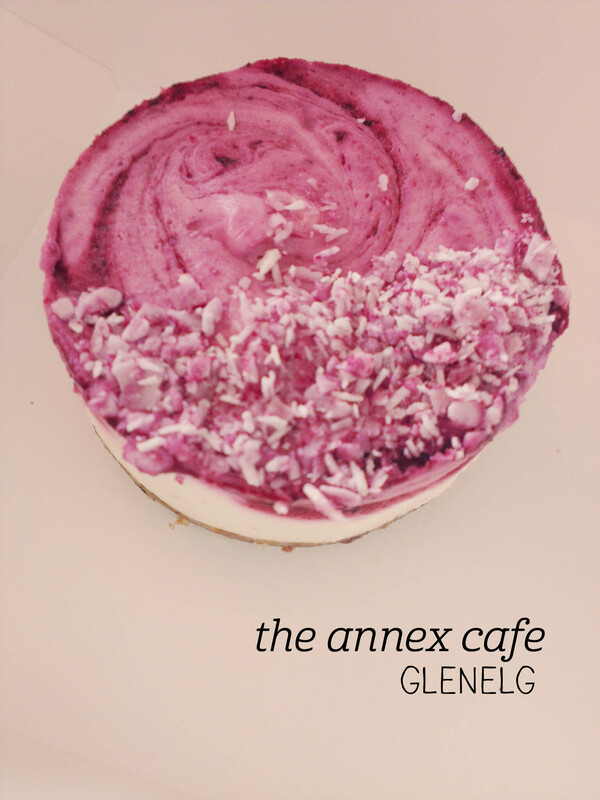 I’ve walked past The Annex Cafe a few times now, but only recently got the chance to stop in and treat myself to one of their beautiful sweets! The small space is made welcoming by wooden furniture and succulents in planters on each table – otherwise there are lovely outdoor seats around the corner. The cake display cabinet is full of dietary-requirement-friendly treats, and it was hard to only pick one. Finally, I chose the lemon and raspberry cake ($7), which is gluten and dairy-free (yay!). Whilst much smaller than a slice from, say Nutrition Republic, given the density of raw cakes I probably wouldn’t have wanted it too much bigger anyway. The cake was in three layers – the coconut base, a white lemon layer and the red swirly raspberry layer, with extra coconut dusted over the top. I could clearly taste each flavour when trying the layers separately, and when combined the dominant flavour was coconut, closely followed by lemon. The raspberry seemed to fade just to add a bit of tartness to the overall taste. The whole thing was so moreish, with that fabulous texture that raw cakes have. Yum!